Sorry Kim Kardashian, Ryan isn't feeling your look. Even if you're not that into ~fashion~ you've probably noticed that many celebrities have recently ditched their oversized sunglasses for a pair of tiny ones. I'm going to throw it out there and say that Kanye West is kinda to blame for this '90s resurgence. 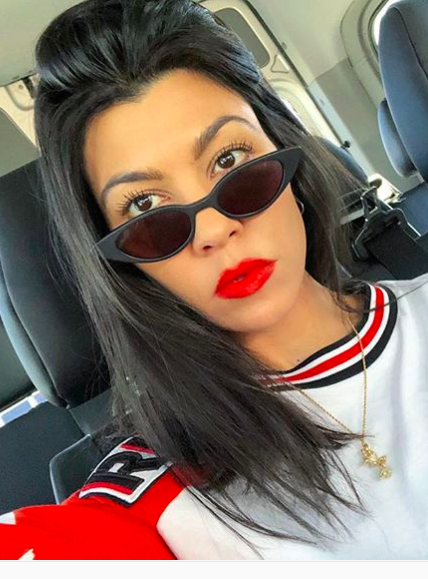 Earlier this year he emailed Kim Kardashian to say she must ditch her large shades and replace them with smaller ones, and the memo then spread to the rest of the Kardashian/Jenners and beyond. Some celebrities, however, are not fans of this look. Both Mindy Kaling and Anne Hathaway have recently said they'll be avoiding the trend. Well, now it appears that they're not the only celebrities who aren't fans of the trend. Enter Ryan Reynolds. Ryan posted this photo of himself on Instagram wearing what appear to be a pair of glasses belonging to a small child – perhaps one of his two daughters. He shared the snap alongside this caption. And of course, everybody loved it. So, for everyone who's rocking this current trend, I'm afraid a fashion icon has spoken. It's over.